EDITORS NOTE: Faye Burch is a consultant who works with women and minority contractors. This article responds to a story in The Skanner about an initiative by the Carpenters and Engineers unions to create a model diversity contract that they hope other construction trades unions will also decide to adopt. The goals outlined by the Carpenters union already are in place at several public agencies, including the City of Portland, Multnomah County and TriMet –to name a few. They represent the same percentages being proposed so this is not new information. First Tier subcontractors with contracts over $100,000 must register as training agents with a BOLI (Bureau of Labor and Industry) certified training program that can be either union or non-union, and utilize apprentices for 20 percent of their total work hours. And the apprentices must include 20 percent minorities and 10 percent women. These training programs could be expanded to include more trades and implement more training in the trucking and flagging areas, where there are numerous opportunities to diversify the workforce. However, approval for all training programs must go thru BOLI, which has a heavy union membership. If the Carpenters union is suggesting this document constitutes an improvement, then unions must also shoulder the responsibility for the very low African American participation in the construction trades today. (see BOLI report 2009 - Diversifying the Construction Workforce). Currently minorities and specifically African Americans have low participation? Will this "new" program increase participation and if not will unions accept mandatory requirements to bring in more Black members and diversify? The Carpenters have higher diversity and better community relationships than most other unions. They also have shown an interest in direct entry from diverse pre-apprentice programs. However, these relationships often don't last, when apprentices find their union dues keep rising, yet they have not been placed in steady work, because they are stuck at the bottom of the dispatch list. What is new about what is being introduced? If the agreement was to be adopted in all public works programs, everyone certified as a training agent to meet these goals on their projects would now be under the union umbrella. Could non-union business independence survive? The model agreement also appears to relieve the unions of the responsibility for maintaining the diversity needed for public works projects. Frequently, they cannot or will not meet the diversity requests for public works requirements and most unions will not allow you to request by name or to fulfill a diversity requirement. In fact the minority workforce often sits at the bottom of the call out list. This means that even with diversity goals in place, contractors are usually not able to meet those requirements under the current union dispatch rules. They will be assigned the next person on the list –and more often than not that will be a white male. 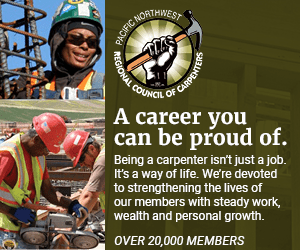 The Oregon branch of the National Association of Minority Contractors has both union and non-union members. Frequently the union members are ridiculed for their lack of diversity on job sites because they are required to accept that individual next on the list. Others have done their own recruiting and used hands-on approaches to sponsor minorities into their unions, which has not been an easy task to take on. The unions appear to have influence on political decisions and the ability to establish PLA agreements, because they can assist with elections, turn out volunteers and voters. Those with other opinions have the same right to voice your concerns and become active for the things you believe in. Pressure could be removed from politicians, however, by creating a more public and transparent decision making process. Minorities have a history of being denied admittance to the unions unless they had family connections. Instead we learned and perfected our trades without union support. So it certainly is a 180 degree change for unions to seek mandates for minorities to join. The Carpenters were an active partner with the 'Fair Contracting group', organized to create dissention and confusion among non-union minority firms and their employees, on job sites. Does this agreement mean that these actions will cease? They have indicated that minority firms will be exempt under this program –will they still be subjected to the master agreement, and who will represent non -union minority firms at the table when these agreements are being discussed. The Carpenters are just one union and the growing pressure of becoming a union state allows the other unions to exert more forceful pressure to unionize. A non-union minority firm will likely have difficulty surviving this type of pressure. Nothing about the way the unions currently work or have worked in the past indicate that this will be a long term commitment to minority owned firms. The current leadership of the Carpenters union may sincerely intend to keep their commitment, but what will happen when new leaders take over? Will the Unions be looking for more opportunities for Minority firms and their workforce? Oregon instead of being a state of choice will become a union state, if PLAs are adopted on all public works projects. Despite Oregon's unemployment statistics, in many statements about large public and private projects, (from stimulus projects, and bridge projects to University projects,) the unions continually state that they need to know the demands for the workforce so they can recruit people from other states. Where is the commitment to putting Oregonians back to work? Unions must support hiring from the non union workforce, where many unemployed Oregonians need the work. Some unions request PLA Agreements that only allow individuals who sign up to be under the purview of the union to work on these projects, though these projects are also partially supported by the public's dollars, public land and public employee planning processes. Union membership works well for a lot of individual businesses and others are members for convenience and the growth opportunity it provides, I think that they all would tell you that because they are minority and union they receive a different set of benefits, or market recovery opportunities or other as it relates to optional decisions made by the union. NAMC Oregon is not a proponent of either union or non-union, What we are a proponent of is choice. We strongly believe our choices should not be removed.